A meeting to decide whether to approve 980 new homes at Pagham came to a confusing end when it was suspended halfway through. 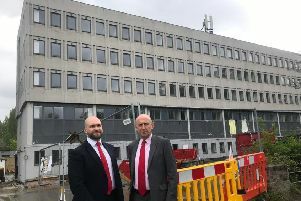 Three outline applications were on the agenda at a special meeting of Arun District Council’s development control committee – but only one had been dealt with when chairman Richard Bower (Con, East Preston) brought things to a grinding halt. The meeting, which became more and more bad-tempered with each passing hour, played out to a packed public gallery, some of whom had no qualms about making their views known. The applications were all extremely unpopular with residents, attracting around 3,000 objections, and several people applied to speak at the meeting. The first hint of enmity came after Lilian Richardson, of Aldwick Parish Council, had spoken against the plans. As spectators applauded her words, Mr Bower reminded them they were at a meeting in public and ‘not on a game show’ – and was immediately met with calls to apologise. He said his words were not meant to be patronising. The first application was for access only to land south of Summer Lane, with plans for up to 400 homes, a care home for up to 70 people and land for a primary school. It was approved by seven votes to five with two abstentions. It was during the second application, for land north of Hook Lane, including up to 300 homes, a primary school and a care home for up to 80 people, that things took a turn. The planning officers had recommended approval but this was voted down by seven votes to six with one abstention. The cheers from the public gallery soon faded when members were told no sufficient reason had been given to refuse, so a deferral was suggested. There had been concerns that access to the site from Pagham Road was dangerous as it was too close to the Hook Lane junction. After much discussion a vote was taken to defer the application so that consideration of this could be carried out. The vote was lost by eight to five with one abstention. It was at this point that a member of the public passed a note to one of the councillors and Mr Bower threatened to suspend the meeting. He made good on that threat moments later as officers and members scrabbled around for reasons to defer.